The widowed Catherine Ireland Cook had inherited a substantial amount of property below 14th Street by the last quarter of the 19th century. The Ireland and Clinch families had made fortunes in Manhattan real estate. That portion of those family holdings which was not passed to Catherine, much of it in the Greenwich Village area, went to her cousin, Cornelia Clinch Stewart--the wife of department store magnate Alexander Turney Stewart. Catherine's husband, Edward Mitchell Cook, had died in 1856 (not too soon for them to have 11 children). Walter was the tenth to come along, born in 1846. Determined on a life in architecture, he graduated from Harvard College in 1869, then studied in Munich and Paris. 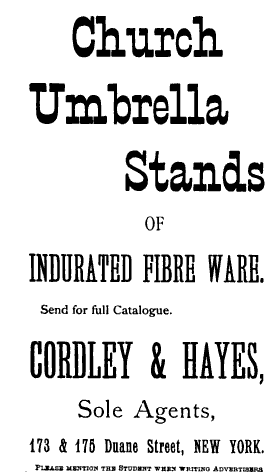 Upon returning in 1877 he joined with George Fletcher Babb to form Babb & Cook. So it is not surprising that when Catherine Cook embarked on a project two years later to replace the old wooden building at No. 175 Duane Street and the brick house at No. 173 she chose her son and his partner as the architects. And she could not have been disappointed. Completed in 1880 it exemplified the restrained use of Romanesque Revival architecture in a utilitarian structure. 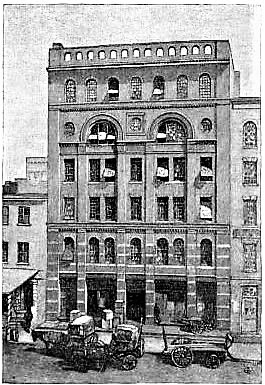 Critic Edith M. Thomas, writing in The Century Illustrated Monthly Magazine on August 1884 praised the architects' solution to designing a warehouse. "There was little to work with here: cheap materials, scanty ornament, and not even a corner site; only one of those narrow facades that go so far to discourage effort. But effort, intelligent effort, has been brought to bear, and the result is fine in the first and chief essential of good architecture--fine in composition." Thomas beamed at the three-story arches that relieved the potential heaviness of the overall-design, and the "simplicity, appropriateness, and architectural feeling" presented by the use of arcades and shallow pilasters. She asked her readers to "imagine one of our unpretentious business streets lined with buildings of this sort," saying it would be "one in which we should find true pleasure." Catherine Cook's first tenant was the wholesale dry goods firm of Wright, Bliss & Fabyan. The size of its operation was evidenced in 1880 when an estimated 40,000 paraders filled Fifth Avenue to encourage Ulysses S. Grant to run for a third term. On October 11 the president reviewed the parade from the stands in Madison Square. The New York Times remarked that Wright, Bliss & Fabyan "provided about 150 men." By 1884 D. Buchner & Co. had taken over the entire building as well as the one directly behind at No. 14 Jay Street. The firm erected iron bridges across the rear yards to span the 10-foot gap between the structures. The company dealt in wholesale tobacco. One of David Buchner's employees was traveling salesman A Maas. On September 4, 1884 he told a reporter from The New York Times that Maas "had been in his employ for some time" and that he came with excellent recommendations. "He was a young man of good address, a persuasive talker, and seemed to be acquainted with many business men throughout the country, especially in the South." The article said "Mr. Buchner thought he would make an excellent salesman, and engaged him." David Buchner's instincts were off the mark this time. Maas began presenting D. Buchner & Co. checks to clients who then gave him cash. By the time the shop owners realized they had been duped, Maas had moved on. Finally David Buchner headed his employee off. He telegraphed his agent in New Orleans and when Maas called on him, he had him locked up. But the slippery con-man managed to get out of jail and headed to Hot Springs, Arkansas. There he presented a $200 check to a Mr. Brown "and persuaded him to give him a loan of $200." That amount alone would equal more than $5,000 today and it was only one of several similar checks cashed. Brown telegraphed Buchner, who replied that "he had been imposed upon." Brown had Maas arrested. Not surprisingly, The Times described Maas as a "former" employee. Buchner had established his firm in 1876 with partner Louis Beckel and by now New York's Great Industries said "The business of this great manufactory is simply enormous." The firm made "fine cut, plug and smoking tobaccos, snuff and cigarettes." New York's Great Industries described the firm's physical lay-out in 1885, saying that the "immense factory and salesrooms are located at Nos. 173 and 175 Duane streets, and extend through to Nos. 14 Jay street." The Duane Street building held "fine cut smoking and cigarette factory," while the eight-story Jay Street structure was the firm's "plug tobacco factory." The article mentioned that both Buchner and Beckel were "well-known in both social and commercial circles as gentlemen of strict honor and integrity." 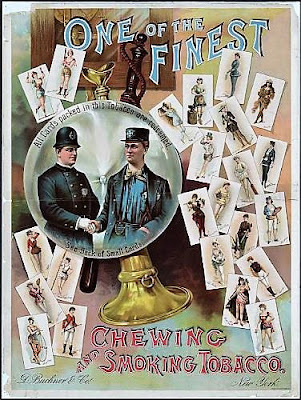 Around 10:00 on the night of Friday, August 20, 1886 residents in the neighborhood began smelling burning tobacco. The New York Times did not hold back in criticizing officials for not looking into a potential problem. "It does not appear that either the private watchman or the policeman on patrol made any intelligent effort to trace to odor to its source." By 3:00 in the morning the smell of tobacco was so intense that residents of a Jay Street tenement building next door to No. 14 were unable to sleep. Finally, at 6:30 a.m. "dense black smoke was seen pouring from the windows of the fifth floor of the Jay-street side, and the panes of glass were soon bursting from the intense heat behind them." By now the three upper floors were engulfed in flames. Three hours later the fire was finally extinguished. The upper four floors of the Jay Street building were gutted and the roof was gone. The lower floors were "water-soaked," according to The Times. D. Buchner & Co. owned that building, while they leased the Duane Street structure, which was only slightly damaged, from Catherine Cook. The severe loss of about $1.3 million in today's dollars may have prompted D. Buchner & Co. to move on. 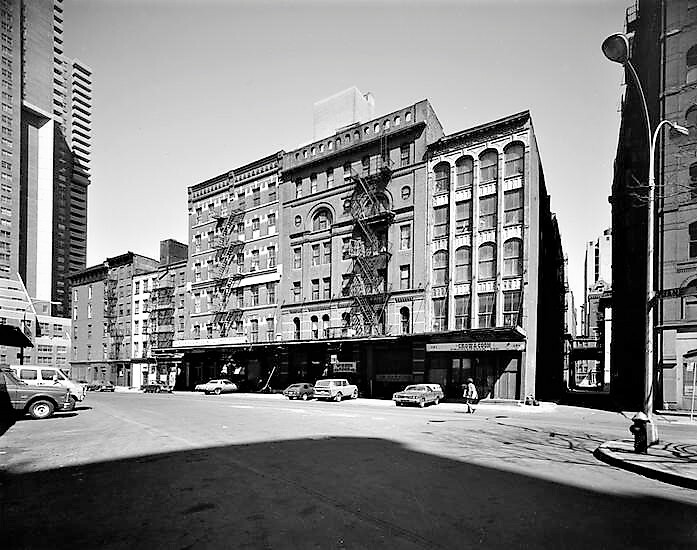 By 1888 the Duane Street building was shared by mechanical engineer Albert Gray and manufacturers Cordley & Hayes. Albert Gray was a pioneer in providing electrical power in New York City. He had started out in 1874 installing steam power plants in commercial buildings downtown. In 1889 he explained to a reporter from Electric Power magazine "But there soon became a limit to that means of supplying power, and the rapid development of the electric system has enable me to distribute electrical power over an area of ten or twelve square miles with the same economy and safety as was formerly done with shafts and belting over four city blocks." 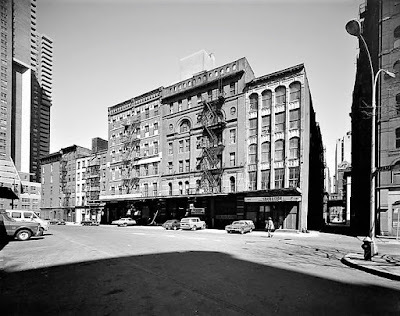 From his Duane Street operation Gray now supplied more than 150 customers west of Broadway and below Canal Street with electric power for elevators and machinery. On November 10, 1888 a fire gutted the paper factory of Cornell, Bingham &b Co. on Mission Place. The firm found a new building on Duane Street, directly opposite Nos. 173-175. Electric Power reported "They could buy presses and the other machinery quick enough, but they did not wish to go to the expense of putting in a steam engine...The result was that in three hours Mr. Gray had put in an electric motor of sufficient power to run a big elevator and all the other machinery, and supplied the requisite electricity from wires stretched across the street from 173 and 175 Duane street." 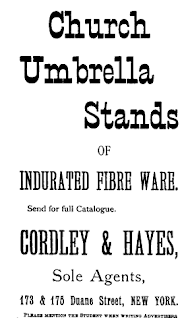 Cordley & Hayes manufactured and were agents of makers of a broad array of products, including fire buckets, fire extinguishers, "indurated fibre ware," and telegraph and telephone supplies. Cordley & Hayes left the building just in time for a frantic printer, Martin B. Brown, to lease the space it had occupied. Although 1893 was not a presidential election year, a huge turn-out was expected at the polls. Brown had the contract for printing 8 million ballots, the design of which was changed at the last minute. On October 24 The Evening World reported "Mr. Brown has assured the Bureau of Elections that the ballots will be delivered at the various police precincts at least twelve hours before the polls open." It was not a small challenge. Brown leased the space in the Duane Street building not for printing, but for inspection and sorting. "Four entire floors of the big brick structure at 173 and 175 Duane street have been hired this year, and there it is that the army of young women required to sort, classify and pack the ballots will work night and day for the next week." The printing, which began on October 25, required 120 tons of paper and the presses ran 24 hours a day. The Evening World reported "At 7 o'clock to-morrow morning 200 girls will be on hand at 173 Duane street to sort the slips of paper which will be furnished them by the million." The system worked and the following year it was repeated here. In both instances "The utmost care is taken to protect the ballots from thieves, and a fireman and an ordinance policeman are constantly on guard," reported The Sun on October 26, 1894. Catherine Cook had died around 1887 and her properties were now being handled by the Ireland Real Estate Company. When Albert Gray's electrical power company failed early in November 1894 the landlord sued him personally for the Duane Street rent, nearly $84,000 today. It was emotionally too much for the engineer to handle. Proceedings against him had begun when The Evening World reported on May 14, 1895 that he was suffering "from paresis." The emotional strain had resulted in a type of paralysis. "A physician's certificate as to Mr. Gray's mental condition was submitted to Justice Ingraham in Supreme Court Chambers to-day as a reason shy his examination in supplementary proceedings should be adjourned." The following day The New York Times ran a headline reading "His Mind Almost Wholly Gone" and reported "there is no hope for his recovery." Calling Gray "the well-known mechanical engineer," the article went on to say that Dr. George H. R. Bennett testified "that it would be dangerous to submit the patient to any excitement, and that for the purposes of examination as a witness his testimony would be worthless, as his mind is almost wholly gone." The building was vacant in April 1900 when the Ireland Real Estate Company hired Chicago architect George H. Kennedy to do $1,800 in renovations, including moving interior walls. The choice of architects was no doubt influenced by the new tenants, Chicago-based concern, Armour & Co. Although thought of today as solely a meat-packing company, Armour & Co. at the time was highly involved in the butter market as well, including the relatively new oleomargarine product. 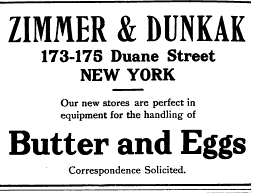 It was a logical location for the firm, since the Duane Street neighborhood had become the center of the butter and egg district. In 1903 the firm, according to The New York Times on January 6, attempted to "corner" the butter market. The newspaper accused Armour of sending "oily agents" into the central New York dairy farm lands in an attempt to "purchase the entire butter output of this district, amounting to several million pounds of first-class creamery butter per annum." The massive firm was at least somewhat successful. In 1916 the New York Produce Review reported that "Armour & Co...handled 28,000,000 pounds of butter." In 1912 Armour & Co. moved to new facilities and the entire building was leased to Zimmer & Dunkak, butter and egg merchants. The ten-year lease totaled $100,000, or about $261,000 per year today. Henry Dunkak and Edward Zimmer had established the firm in 1885. 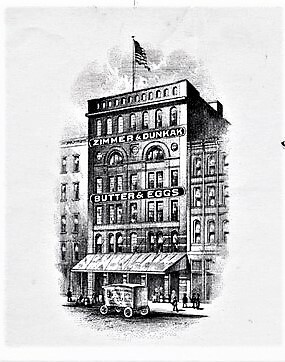 Although Zimmer retired in 1922 and Dunkan died in May 1926, the company continued in business under the original name. Zimmer & Dunkak remained in the building into the 1930's. Butter and egg merchants continued to call Nos. 173 and 175 Duane Street home, including the Golden Eagle Farm Products, the Seville Packing Company and ABC Dairy Products in the 1940's. Irving Fuchs' business was here in 1944 when he was named in the Regional Office of Price Administration's injunction for selling inferior butter as top-quality. Fuchs' troubles did not teach a lesson to 48-year old Martin Miller, an executive in the Egg Purchasers Marketing Corporation. On May 4, 1953 he was charged by Department of Agriculture in what was deemed an "egg fraud plot." The New York Times reported "A Federal grand jury charged that [two] inspectors accepted bribes to approve and grade inferior eggs without examination." The first hint that the arts were moving into the gritty Tribeca neighborhood came in 1977 when artist Rob Mango took the job of building super. In his book 100 Paintings: An Artist's Life in New York City, he writes "I became the building's superintendent and nightwatchman. Jeff [Lamb] and I responded to every kind of mechanical crisis imaginable to 175 Duane." Mango recalled "Since the block had been an egg and cheese neighborhood for a hundred years, the mice and rats were not moving out any time soon--unlike the dairymen and artists. Invariably I dozed off, to be woken by the scrabbling nest-building activities of the hard-working rodents." While he sat up nights protecting the building, he worked on "sculpture and assemblages" in a make-shift studio. His works, visible from outside, lured passersby in from the street. By 1988 the Dannheiser Foundation was in the building, established by Werner and Elaine Dannheisser to exhibit their collection of works by living artists. Their 35-year collection of more than 1,000 artworks were shown free of charge to anyone calling for an appointment. The loft space could accommodate 100 persons at a time, making it viable to dance and other performances as well. In 1996 the building was converted to artist "living/work quarters," just one apartment per floor. If they were originally leased to struggling artists, that was not the case by 2017. That year artist Richard Serra purchased the second floor loft, spending $7 million. The New York Times said "The 4,200-square-foot unit has two bedrooms and two baths, along with a spacious artist's studio, a gym/yoga room and a great room. He and his wife, Clara, already own a full-floor apartment on the third floor." The rat problem, apparently, had been taken care of.